Bombing …. a bit close to home! 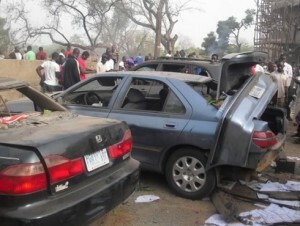 Around 7:30 a.m. on Sunday 26th February, a suicide bomber smashed his car through the gates of COCIN HQ church in Jos, Plateau State. The bomber failed to reach the church building but still managed to kill 3 people and injure numerous worshippers. Dozens of cars were badly damaged and glass was showered everywhere. What made this outrage a little more personal was that I had been worshipping in that church just two weeks earlier. The seats occupied by me and my friends were seats that were showered with glass and debris, causing painful injuries and damaging ear drums. That’s a bit too close for comfort! But it is a risk that every worshipper faces each time they set off for church on Sunday morning. Churches routinely search worshippers and metal scanners are as widely used as hymn books. COCIN HQ had set up road blocks where every car was stopped and searched; questions will be asked why the bomber got past those blocks. So next time you are tempted to stay away from church for some minor reason, think about church goers in Central and Northern Nigeria who, quite literally, risk their lives every time they set off to worship. Remember the old drinking fountains? Would you get up before dawn to collect muddy water from dew-pools that have formed overnight? Would you dig into the sandy river bank to get your water for your children to drink? That’s how many of the communities that we support get their drinking water. How fair is that in the 21st century? TASTE has helped a number of communities in the last year or two. Additionally, we have been supporting SIM City Ministries, who work with widows and street kids in all the major cities of Nigeria. Working in Nigeria has many challenges, not least that bribery and corruption are so wide-spread. TASTE seeks to take a very clear stance – we want to be seen as an organisation that is explicitly Christian; one whose standards are the highest, in every aspect of our work; and an organisation that takes a zero-tolerance stance against corruption of any kind.